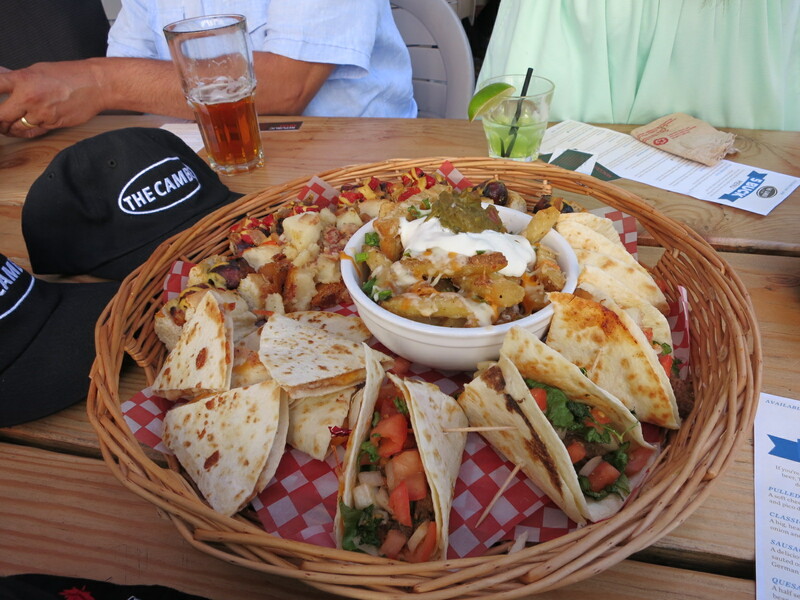 I was recently invited to the Cambie with a group of bloggers to preview the launch of their new $5 food menu. The Cambie is best known for their cheap drinks and dive bar atmosphere, but they are trying to draw more attention to their food menu. There are around 10 items on the new $5 menu and it is only available from 11:00am – 6:00pm. 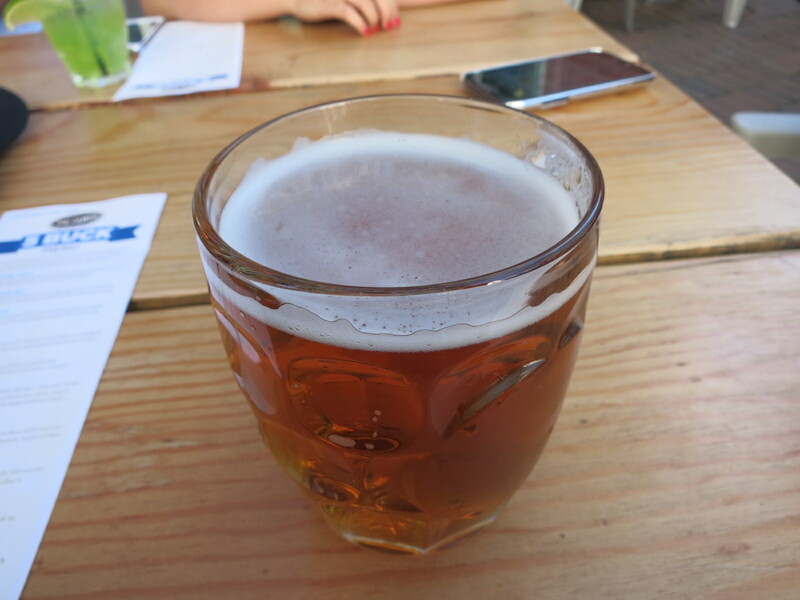 I started off with a Granville Island Honey Lager to drink. I love this beer. It is sweet and easy to drink; it’s the perfect drink for summer. We were served a tasting platter of their pulled pork tacos, quesadillas, sausage on a bun, and Irish nachos. Pulled pork tacos are a good safe choice because pulled pork is rarely bad. The pork was tender and the tacos were filled with lettuce and fresh salsa. The quesadillas were filled with cheese and refried beans. A quesadilla is a quesadilla and they are pretty standard anywhere you go. I wouldn’t order one because you could just make them at home, but if you like quesadillas and just want something cheesy then this would do the trick. The sausage on a bun was really good. They use a mild Italian sausage on a home-made bun topped with sautéed onions and roasted red peppers. The sausage was juicy and flavourful and the buns tasted freshly made. This also comes with a German potato salad, which was also good (because it was filled with bacon). The Irish nachos were a hit at the table. The dish is made with french fries topped with green onions, cheese, sour cream, and guacamole. With that combination of ingredients you cannot fail. 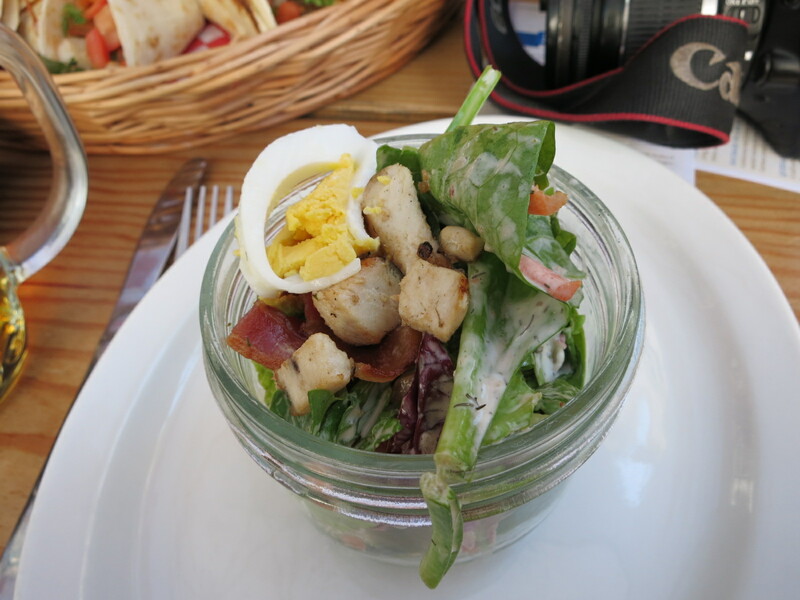 The cobb salad was hearty for a salad and had lots of chicken, bacon, and egg inside. A salad doesn’t really seem like pub food/drinking food to me, but you know there will always be some person who wants a salad and this is a good option for them. 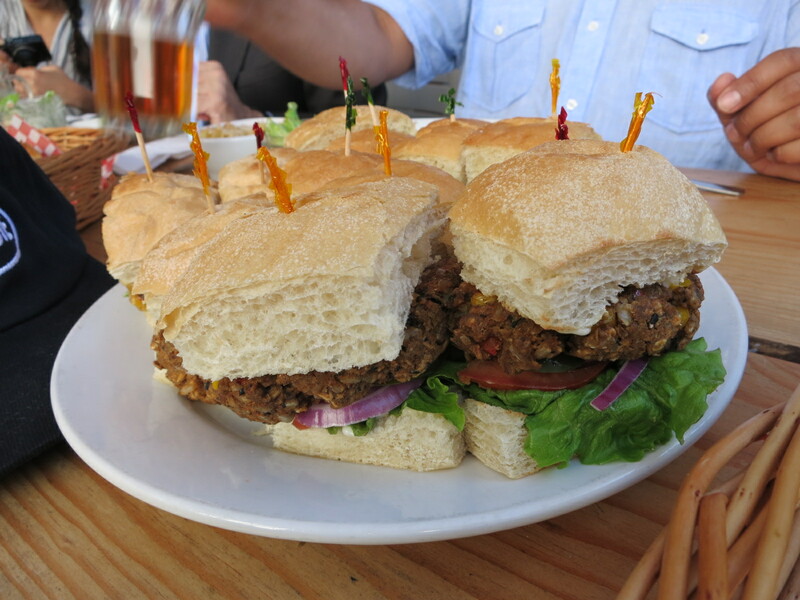 We sampled both the mini beef and veggie burgers. I’m picky when it comes to burgers and the beef burger didn’t do it for me. Mine was over cooked and it tasted too pre formed. The veggie burger on the other hand, was actually really good. They make it with a mix of chickpeas and other chunks of vegetables and it was flavourful and had a good texture. It was like eating a good falafel on a burger bun. 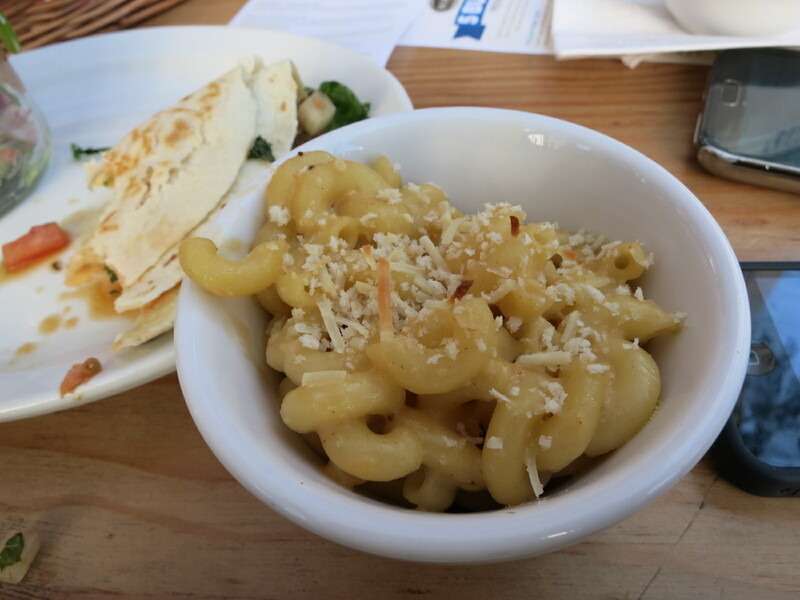 The mac and cheese is made with a nutmeg bechamel sauce and topped with a panko parmesan crust. I don’t like mac and cheese in general (I know, I’m a freak) so I’m not the best authority on it. This version wasn’t very cheesy though and it seemed more like pasta than a gooey mac and cheese. Finding anything to eat for $5 is a challenge these days. You can’t even eat at McDonald’s for $5 anymore, so I can appreciate the effort the Cambie is making to create a cheap eats menu. Food for $5 is never going to blow your mind, but there were plenty of good options here that I would order again. Yes, for really cheap eats and drinks.